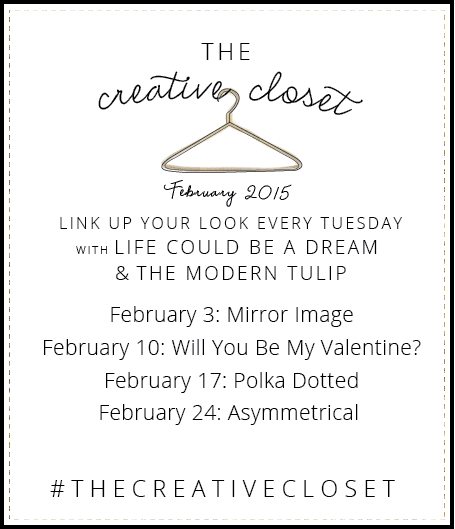 The Creative Closet || Will You Be My Valentine? This year I do feel a bit differently. I am seriously blaming it on the pregnancy hormones, but I'm acting as a bit of a sap. More than anything I'm just thankful for my Valentine this year. The man I married has become such a rock in my foundation. He challenges me, constantly keeps me laughing and encourages me like no one else can. Watching him change throughout the last 8 months from being just a husband to adding the role of father has been such a delight. Maddox will grow up with the most wonderful role model in his life. That's the perfect gift this Valentine's Day! It's all I could ever want. PS. 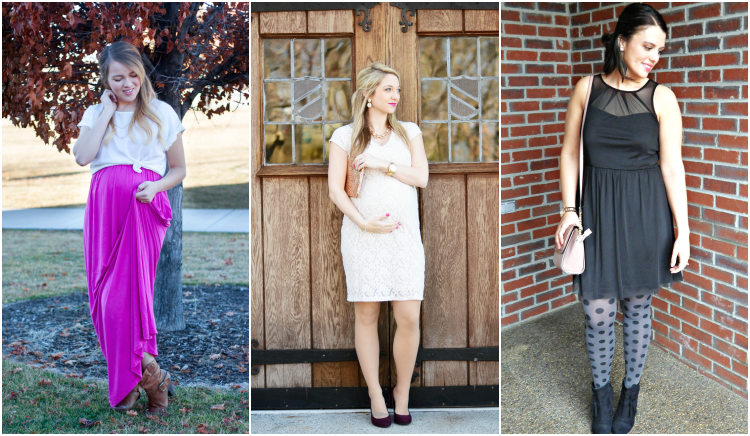 Pair your Valentines Day outfit with this easy 5-Step braid I shared yesterday for a fun look! How great do these ladies look? Jana and Rachel both are going to knock their mens' socks off! Are you looking for an excuse to wear polka dots? We've got you covered! Join us next week for our Polka Dot theme and show up how you style them whether it's retro or pattern mixing we want to see it! Please remember that The Creative Closet is not like most style linkups. To link up with us you must address the prompt in some way and acknowledge that you linked up to The Creative Closet in your post. Posts that do not will be deleted. 28 comments on "The Creative Closet || Will You Be My Valentine?" You look absolutely gorgeous girl! I love the pink lips matching the pink nails! girl, you are rocking that bold lip! love the lip color and your Valentine's inspired dress! You look beautiful Maeg, :) Glowing from head to toe! ahhh, I love this dress! SO pretty! I've never been a big fan of Valentine's either!! We usually just go out to eat, nowhere special & fancy! Which is normal for us any other day of the week too, ha! You look simply stunning! And, what a sweet tribute to your husband - I can only imagine that it's a rewarding and emotional experience to watch your significant other come into the parenting role. Gor. Geous. I love this look--that dress is stunning on you and I love your bright lips and nails. All together, and with the glittery bag, this makes the perfect Valentine's Day ensemble. Bath and Body Works makes clutches?! I'm so behind. Loveeee the lace and the clutch and the pink nails. :) You look beautiful! 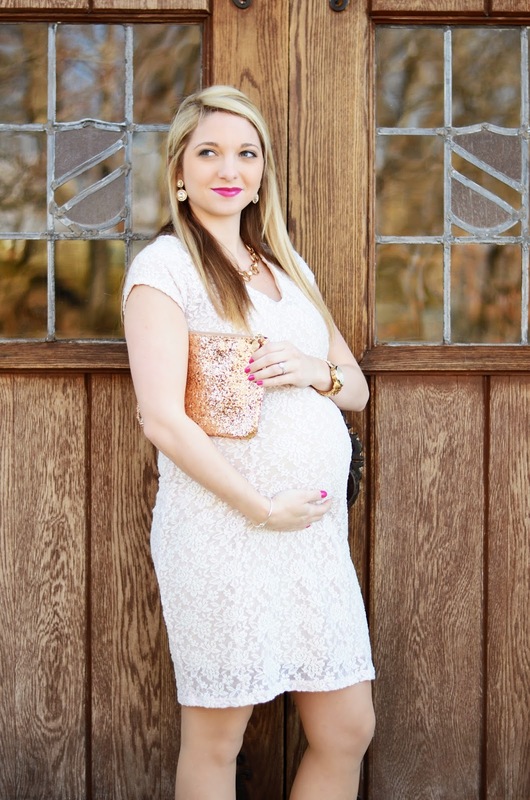 The pink nails & lip are perfectly paired and LOVE that cute lil clutch my friend! You look amazing!! I love the combo of lace, gold and pink! Next pregnancy I hope I look as good as you! Your clutch and earrings are to die for! This whole outfit is so classy and fun! Tyler and I have always had the worst luck on Valentine's day so we have yet to ever make it a big deal in the 3 years we've been together. I don't mind the reminder to show appreciation for your significant other, but I totally agree that one day shouldn't be the be all end all! You're stunning - as usual but this one is really elegant. I love the lipstick paired with the neutral outfit. Also... I'm with you 100% on the Valentine's Day stuff. David didn't even know when it was! PERFECTION. Love this so much, even though I'm so jealous of your short sleeves!!! Gorgeous. Absolutely gorgeous! I hope when I'm pregnant I can pull it off as flawlessly as you do. Oh my goodness gracious, I swear that dress was made with you in mind! It's the epitome of perfection on you! Lace is always so feminine and pretty, perfect for dater night! This is such a pretty look and your rocking it bump and all. I absolutely love the clutch too - hello sparkle! You can blame pregnancy hormones for absolutely everything!! It seriously messes with our feelings lol. I'm a bit the same - I think it's funny that Valentine's Day is such a marketing ploy - and that it worked so well!! - but then again, at the same time I'm a hopeless romantic every other day of the year so I can't get too annoyed by the 14th. :) I just prefer when I get the romantic gestures on other days! Your outfit is lovely - the lace is so pretty, the gold clutch and accessories are the perfect amount of bling, and the lippy & nail color rocks! :) Love this!! You look great! Oh my goodness you are so gorgeous! That dress and your nail & lip color is just perfect! I love that clutch too! Such a cute and classy look! Im pretty sure this should be in a maternity magazine! Rock it girl! You are gorgeous!!! Love you in that dress! 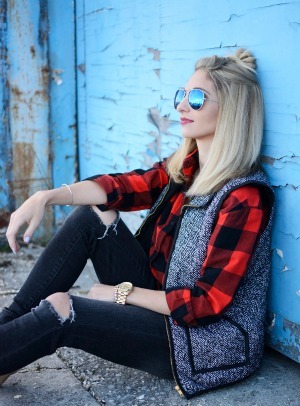 I'm so happy to find another girl blogging who lives in Indianapolis! I love this soft look and its so perfect for Valentine's day. Can't wait to see more from your blog, it's super cute!